There are any number of reasons to be worried about the outlook for the global economy and risk assets. One of them are the elevated spreads in the high yield ("junk") bond market. 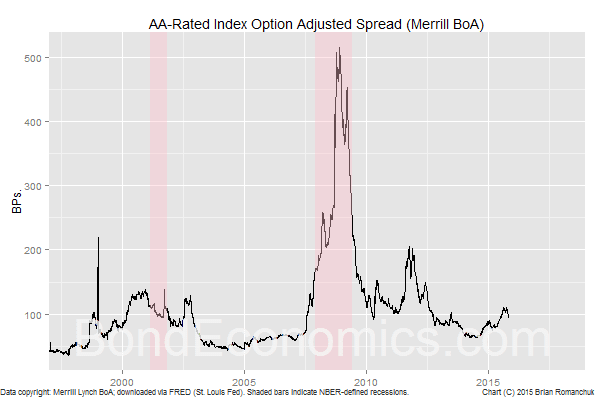 The chart above shows the option-adjusted spread (OAS) for the Merrill Lynch/Bank of America High Yield Master II (U.S. dollar) Index. It has marched out to a relatively high spread, although it is well inside the extremes seen during previous default crises (around 2001 and 2007). However, it is hard to distinguish current events from a "healthy repricing of risk" versus an incipient crisis. Looking at higher quality corporate bonds, the AA-rated component of the Merrill Lynch/Bank of America USD corporate bond indices. It is higher than most of the pre-2007 history, but the wider spread could reflect the technical factor of the increased regulatory costs faced by corporate bond market makers. Unless you are directly involved in the corporate bond market, the only reason to care about it is if it is ceasing to fulfil its function of providing finance to creditworthy borrowers. One of the reasons that the high yield market is trading at a high spread is that there highly leverage borrowers as well as oil extraction businesses that are marching towards bankruptcy. Once it is clear that an issuer is going to default, the bonds switch over to "trading on a price basis;" that is, the bonds are priced based on what the salvage value of the firm's assets are. This drops the price of the bonds to a fairly low value, and the calculated spread values are astronomical. However, a spread is calculated based on the assumption that all payments on the bond will be made; the expected return on investment on the bond is much lower than the spread indicates. This makes the average spread for an index that contains distressed bond much less meaningful. 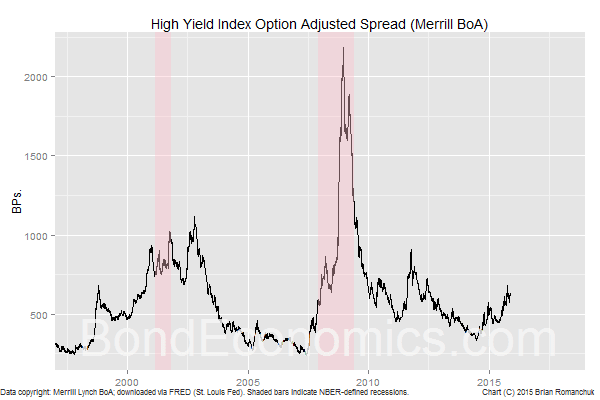 As a result, the high spread of the corporate bond index could just reflect sectoral problems that could be "contained" (in the unfortunate phrasing that was popular before the financial crisis). Although things could deteriorate, there is no sign that financing is unavailable for the creditworthy (a credit crunch). 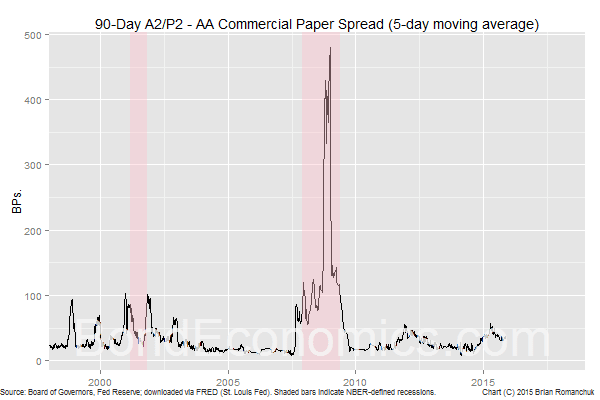 The chart above shows the differential between A2/P2-rated nonfinancial commercial paper and AA-rated commercial paper at the 90-day maturity point (data published by the Fed). The spread differential is somewhat above average, but is not yet at a level that suggests that financing is unavailable. The commercial paper market is probably more important than the corporate bond market for judging financial stress. The term corporate bond market can periodically close for new issuance for any number of reasons, including having all the investment bankers going off to some important sports event. Only a complete rookie corporate treasurer would depend solely upon the corporate bond market being open for new issuance (the "primary market") in order to roll over an outstanding bond nearing maturity. Backup financing methods should always be put in place, and future financing needs should be covered well in advance. However, if the short-term funding market shuts down, issuers with short-dated paper have very little time to deal with impending maturities. As a result, one should focus on the money markets if you are crisis-watching. In summary, there is nothing in the data that is currently available to me (which is not much) that suggests that a financial crisis is imminent -- in the United States, at least.